Markets continue to move mostly with stimulus hopes. The big difference this week was (as covered in part 1) that there were headlines dampening these hopes from China and the US, as well as those feeding these expectations, as was the case with the G20’s tacit acceptance of Japan’s ongoing easing via currency devaluation. The appointment of the new BoJ governor, particularly whether he’s believed to be willing and able to push for the continued JPY debasement and other easing policies markets want to see. Fed Chairman Bernanke’s semi-annual congressional testimony may well clarify whether or not last week’s FOMC minutes’ surprisingly hawkish tone really meant that QE 3 might start winding down sooner than expected. If so, this could be as big a market mover as anything next week, If he confirms that the Fed is indeed moving to tighten in the coming year, he could quite possibly reverse the current uptrend in stocks and downtrend in the USD. Given that he doesn’t want either of these, that the US recovery is trouble clearly in trouble (see here for example), and that official inflation figures remain low, (although there is evidence to the contrary from the recent jump in Monetary Stock) we suspect the odds favor him erring on the dovish side, if not outright quash speculation of QE 3 ending early. However if he doesn’t, there are many (for example here) who would see it this as marking and end to the current risk rally and dollar decline. Although markets may appear transfixed by stimulus speculation or by multi-year highs and upward momentum, which appear to be beckoning to investors, like sirens beckoning sailors to their destruction on rocky shoals, data made more of an impact last week, particularly on Thursday when a wave of putrid data washed ashore from Europe. This was soon forgotten on Friday, due to a combination of ever hopeful bargain hunters buying on a shallow dip after good German Ifo sentiment data provided a minor excuse that things weren’t as bad as Thursday’s data suggested. Even when the EU commission reversed its 2013 EU growth forecasts Friday, from slight growth to recession, markets ignored the data. Ok, so more precisely, data that fit’s the current uptrend in risk assets is still more likely to be heeded than negative data. Still, the rotten EZ PMIs Thursday had impact, though you could say that it was the threat of Fed tightening that really made that possible. The technical picture is conflicted. On one hand, despite the lack of supporting fundamentals, the uptrend in most stock indexes remains firmly entrenched, and again, multi-year highs this close beg to be tested. 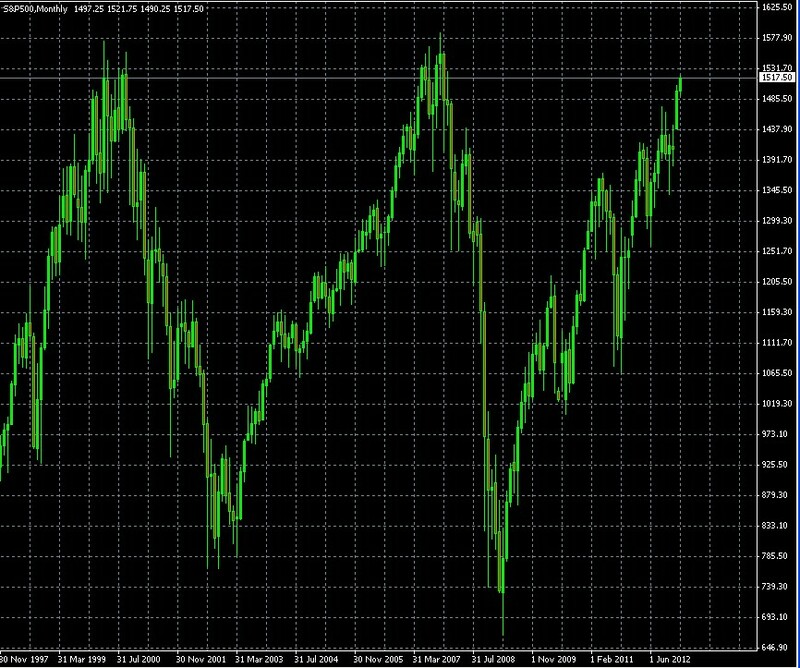 On the other hand, resistance on the S&P 500 around 1500 is scary. See the chart below for what happened the last two times we were here, back in 2000 and 2007. The battle between bullish momentum (slightly weakened after this past week) and bearish resistance remains unresolved. However there are some new hints from currency markets to consider. As we noted in part 1, an important side note to the mixed technical picture that adds bearish bias is that risk currencies like the AUD, NZD, CAD, EUR and GBP have all underperformed or are flat versus the more safe haven USD. That means that currency traders are less optimistic than stock traders. Currency markets have a reputation for leading stocks, so keep an eye on these relative to the USD (the other safe haven currencies, the JPY and CHF, are currently too openly manipulated by their central banks to be reliable indicators). As noted in part 1, those needing some clarification risk versus safety currencies, and why the distinction is so important, can review page 19 (and others) of my book at no charge using the “Look Inside” feature on its amazon.com page here. At the risk of getting more technical, currency markets are also flashing additional new risk aversion signals, as noted by Citibank analyst Steven Englander. See here for details.